IIM Indore has joined hands with IIM Bangalore to offer incubation and training to women interested in starting their own ventures. This is a part of the nationwide ‘Women Start-up Programme’ offering a unique mix of online and face to face training to women who register for the programme. The registration for the programme is free. In addition, selected women entrepreneurial aspirants from central India will be offered a year long incubation at IIM Indore. The training will focus on entrepreneurial and managerial skills. During incubation they will receive mentoring and have opportunities to interact with angel investors /VCs, industry experts and women entrepreneurs. Selected participants will also be provided working space on campus. A ‘Get to know more about the Women Start-up Programme’ event is been organized on January 20, 2018 at Jal Auditorium, South Tukoganj, Indore; from 3 p.m. During the event, interested women aspirants will get an opportunity to interact with professors from IIM Indore and women participant(s) who were selected for the programme in 2017. 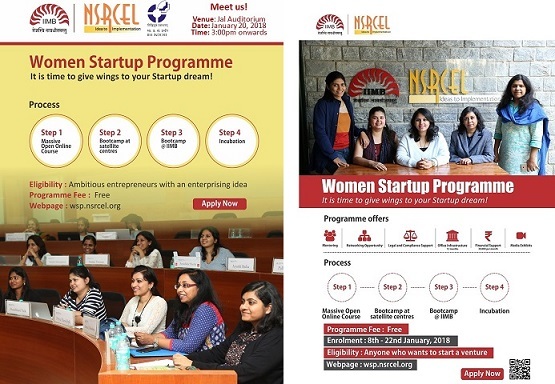 The Women Start-up Programme has been launched with the support of Goldman Sachs and the Department of Science & Technology, Government of India. A six week ‘Do Your Venture’ Massive Open Online Course (MOOC) for up to 12,000 women to systematically identify and test their business ideas. About 300 ventures shortlisted for a boot camp at partner campuses nearest to them will then receive classroom instructions on communications and customer interaction. From this about 100 women entrepreneurs will be selected for a second boot camp at IIMB where they receive classroom instructions on developing a business plan, understanding costing and pricing, sales and marketing, and negotiation skills. Post the boot camp, these women will have their business ideas incubated at a partner campus of their choice for one year.